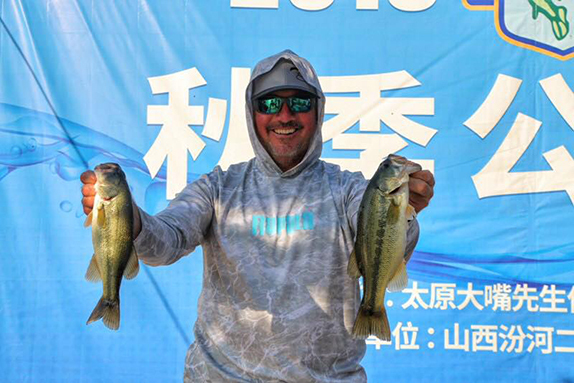 Brandon Cobb was 4th after three days of competition � and had big bass ��at the China B.A.S.S. Nation championship. 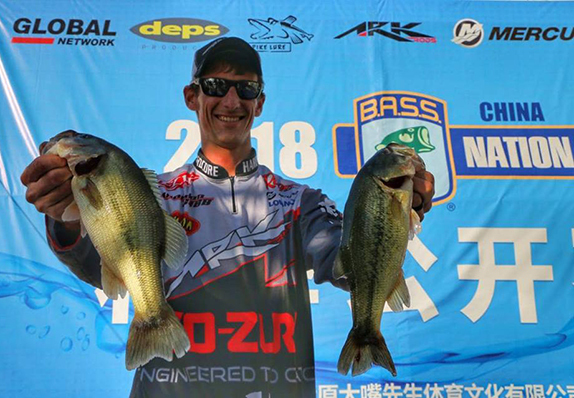 Brandon Cobb got his first taste of bass fishing in China a couple weeks ago. He can�t wait to go back. He also got his first taste of beef entrails on the trip. He wishes he hadn�t. 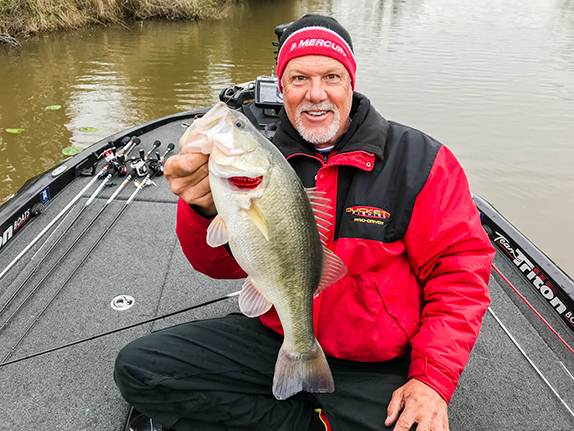 Cobb and fellow bass pro Randall Tharp joined Louie Zhang, owner of Ark Fishing Rods (both Cobb and Tharp are sponsored by Ark) on an eight-day trek to the other side of the globe for the China B.A.S.S. Nation championship tournament. Both Cobb and Tharp participated in the first three days of the competition but did not fish on the final day as their involvement was more of an exhibition. Cobb was in 4th place (9.388 kilograms) after three days while Tharp was 8th (8.581 kg). The tournament was held at Reservoir 2 on the Fenhe River in the Taihang Mountains, roughly an eight-hour drive southwest of Beijing. Cobb said the small lake felt and looked similar to lakes in the Ozarks, and for a lake that has only had bass in it for 10 years, he was pretty impressed with the quality of the fishing. Black bass are not native to China, but the manager of the lake, who also serves as the China B.A.S.S. Nation president, has headed up stocking efforts. For Zhang, who emigrated to the U.S. from China 11 years ago, the trip was not only a chance to see old friends, it offered the opportunity for Chinese anglers to interact with two U.S. pros who they�d only read about in magazines. �The highlight of the trip for me was I got to see all of my good friends back there and they loved to meet Brandon and Randall,� Zhang said. �They had a million questions. I feel like I did something to help fishing over there. There were 33 two-man teams entered in the tournament. China B.A.S.S. Nation began the process of becoming affiliated with B.A.S.S. Nation in 2016. Many fished out of smaller boats while there were a few traditional fiberglass bass boats equipped with 250-hp outboards, including a couple that had the new Mercury 2-stroke engine. Cobb and Tharp each had half a day of practice prior to the tournament. 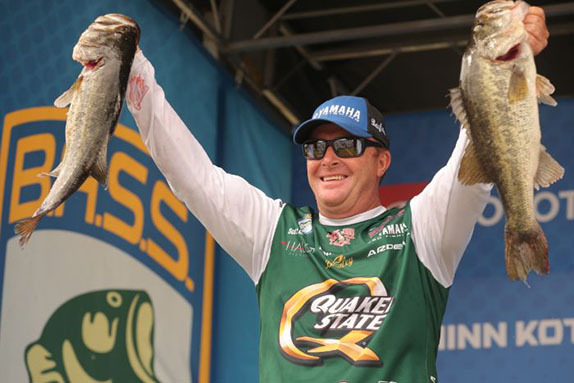 Cobb tried to apply his bank-running approach during the half day of practice and the tournament, but it became evident the best fishing was offshore. He said one notable feature about the lake, beside the towering bluff walls, was the lack of traditional forage that U.S. anglers are accustomed to seeing in lakes and rivers. Cobb said he packed an assortment of Abu Garcia reels and took with him a variety of baits (square-bills, spinnerbaits and soft plastics). 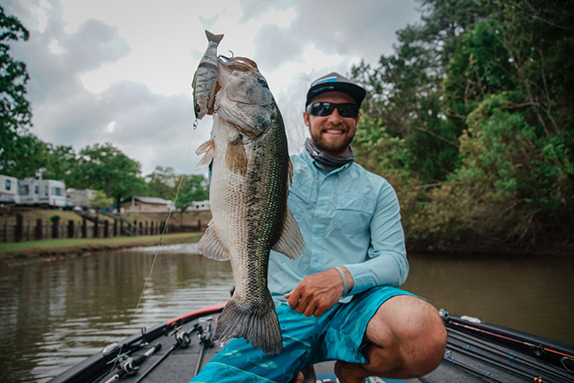 He caught his biggest fish while flipping a Zoom Baby Brush Hog around a trash mat that consisted of nothing more than an array of plastic bottles. He said it weighed �2-plus kilograms,� which equates to approximately 4 � pounds. Randall Tharp shows off two of his keepers from the China B.A.S.S. Nation tournament earlier this month. Cobb also was struck by the contrast in styles between he and Tharp and the Chinese competitors. Having the chance to educate anglers from another country who seemed anxious to learn all they could about the sport made an impact on Cobb. Tharp had made the trip to China last year so some anglers were familiar with him. Cobb, however, was surprised to find he had a bit of a following there, too. �I had a few guys show me the FLW magazine with me in it,� he said. �Randall had been there in the past, so they were huge fans of his because he was one they�d met. Cobb was impressed with the tournament operation as a whole, especially how the weigh-in was run. As anglers waited in line to weigh their fish, a tournament official scanned the weigh bags with a metal detector wand in an effort to detect foreign objects (possibly lead weights). Cobb also said one Chinese competitor drove 27 hours to get to the tournament. Cobb has been to South America before and recently spent time in Alaska. Getting to China involved a flight to Dallas, then a non-stop flight to Beijing followed by an 8-hour bus ride to the region where the tournament was held. On the way back, Cobb and Co. rode a bullet train, which travels as speeds of 200-plus mph. Another highlight of the journey was the Chinese cuisine, which differed greatly from what most Americans know as Chinese food. He said he tried beef stomach and it wasn�t bad, but when he was offered beef intestine, despite Zhang�s recommendation to avoid it, he forged ahead. He immediately regretted it. �It tasted how cow crap smelled and I could taste it for two days,� he said. 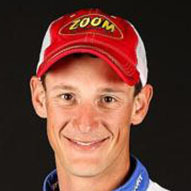 Brent Ehrler � "He's a magician with his electronics." "It's the only sport that's relaxing yet competitive."